So a few weeks ago, I inexplicably bought seven or eight lemons from Whole Foods. They weren’t on sale or anything, I just saw them and on an impulse, bought a whole mesh bag of them. I am proud to say that today, I have finally used up the last two. Thank god lemons have a freakishly long shelf life. For a while, I felt terrible, thinking that because of my impulse, these poor innocent lemons would go to waste. But instead, my split-second decision resulted in a delicious lemon cake. As I was sampling the first slice, I began to wonder why I often condemn impulsivity and so highly value planning and organizing. On the spectrum of thinking to feeling, I’ve always tested more in the thinking category. I like to do my research, whether it’s headphones, restaurants, or papers. Case in point, I spent three days researching headphones under $30. Three days for a pair of cheap headphones. For me, impulsivity is freedom. For a brief moment, I can act simply because I want something. I can buy eight goddamned lemons if I so please, and I can be content with my choice. Recently, a couple of economists published an article on “choice closure,” essentially where second guessing leaves a consumer less satisfied with their choice. I over think in part because I’m scared of being impulsive. I’m scared of making the wrong choice. But I don’t need economics to know that sometimes the right answer simply is the easiest one, the gut feeling. You know that saying, “when life gives you lemons, make lemonade?” Well, the good news is, life never only gives you lemons. It gives you sugar too. So you can mix them together, move forward, and maybe instead of making lemonade, you can instead try making this delicious lemon yogurt cake. Keep it creative. Keep it impulsive. Preheat oven to 350 F. Grease an 8in x 8in pan, then line the bottom with parchment paper. Sift together the flour, salt, and baking powder. In another bowl, mix the yogurt, 1/2 cup of sugar, eggs, lemon zest, and vanilla. Slowly mix the dry ingredients into the wet ingredients. Using a rubber spatula, fold the vegetable oil in the batter until it’s all incorporated. Pour batter into the pan and bake until an inserted toothpick comes out clean, about 50 minutes. Meanwhile, simmer 1/3 cup lemon juice and 1/4 cup sugar until sugar dissolves and mixture is clear. Set aside. When the cake is done, let cool for 10 minutes, then pour on the lemon-sugar mixture. Let cool. 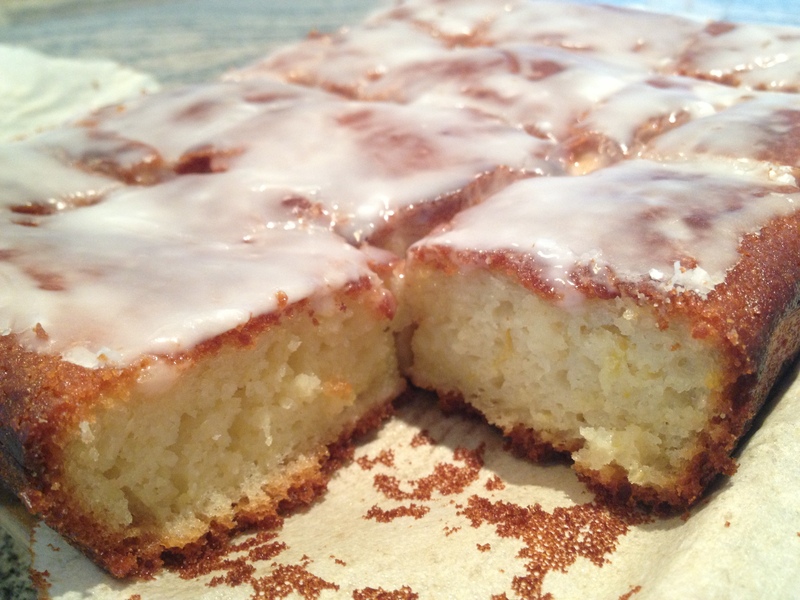 Combine the confectioner’s sugar and lemon juice, then spread on top of the cake. I always have the same problem of trying to use up whatever ingredient that I’ve bought! Cake looks lovely.